A root canal treatment is needed when there is an infection in your tooth. An infection prompts the body to fight the bacteria by sending antibodies and white blood cells to the infected area. The tissue swells and turns red. The canals of the tooth have no room for white blood cells and antibodies. When the pulp tissue inside your tooth is infected, it tries to swell, but instead it chokes and dies. 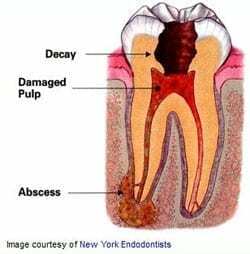 The infection travels down the pulp tissue in the canals of the tooth and reaches the bone tissue surrounding the end of the tooth. The result is a tooth abscess. Root canal treatment is needed for the infection. The treatment involves removing the soft tissue inside the tooth, thoroughly cleaning the tooth, and filling it to the very end with a sealer material. Despite root canal treatment horror stories that you may have heard, the dead tissue prevents you from feeling pain, so the treatment is usually painless. A successful treatment can last a lifetime. While some people think that it’s easier just to have the tooth removed, removing it is actually more painful. If the tooth is weak, it can be saved by protecting it with a dental crown. An infection will continue to spread until it’s treated. If you have a toothache or if you think that you have a tooth infection, it’s important that you seek help promptly. Dr. Duane Delaune is a Master of the Academy of General Dentistry. He will examine your tooth, identify the cause of the pain and give you the right treatment. After the root canal treatment, your tooth will likely need to be protected from further damage. Dr. Delaune will determine which treatment is best for your case. In some cases, a porcelain crown is needed to protect your tooth. If that’s the case, Dr. Delaune is a cosmetic dentist—an accreditation candidate of the American Academy of Cosmetic Dentistry—who will provide you with a porcelain crown that looks like a natural tooth.